You are currently browsing the monthly archive for July 2012. 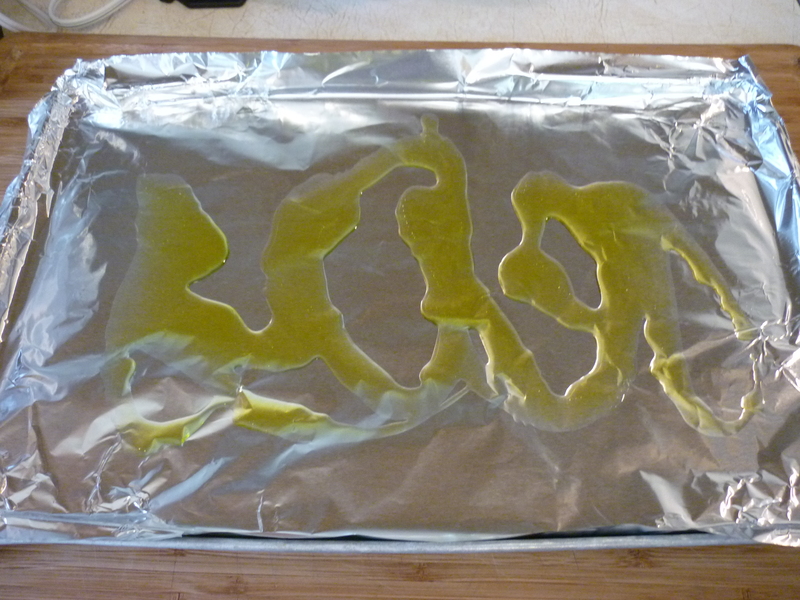 Line a baking sheet with foil and drizzle olive oil on it. 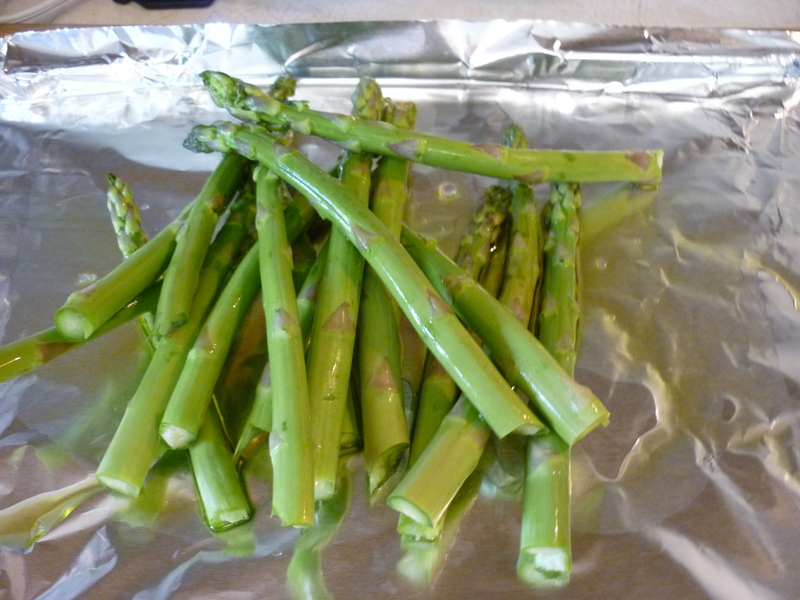 Trim the blunt end of asparagus spears by bending each spear and discarding the part that breaks off. 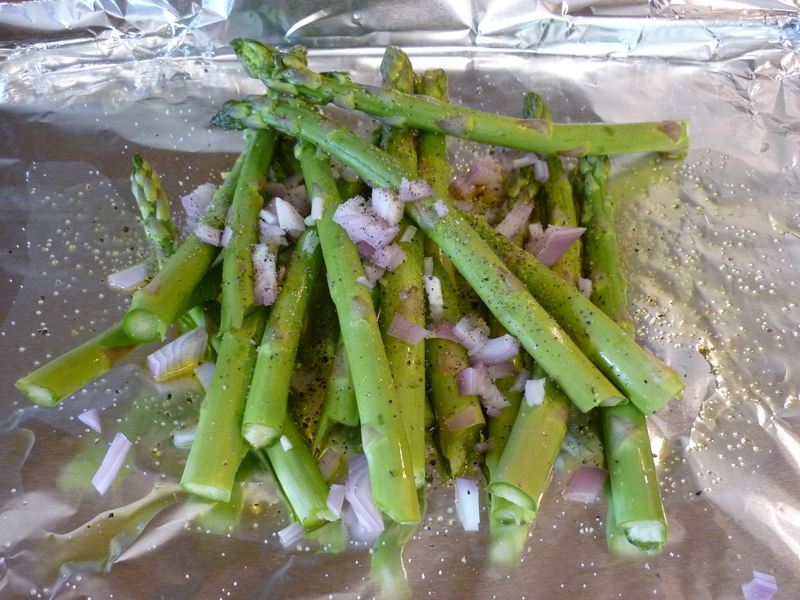 Place the asparagus on the olive oil. 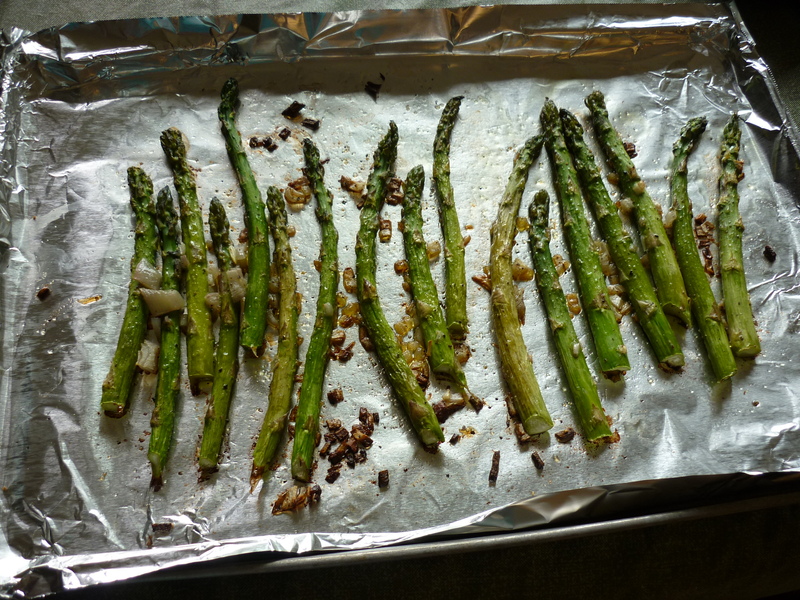 Toss the olive oil, asparagus, and shallot with your hands, then arrange in a single layer across the foil-lined baking sheet. Bake at 400 degrees for 20 minutes. I opened a package of pork loin rib chops the other day only to find one pork chop and the rest pork steaks. 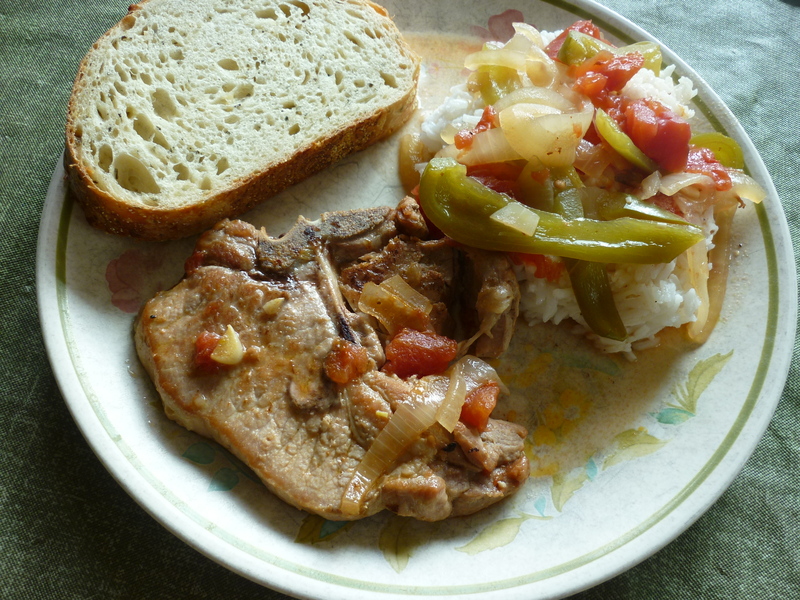 A quick change of plans was in order, but fortunately I had a really great pork steak recipe and all the ingredients. This recipe is based upon one found in The Best of Food & Wine (Doubleday, 1984) and is a dinner staple in my repertoire. In a large deep skillet or kettle, heat 1-1/2 Tbsp. 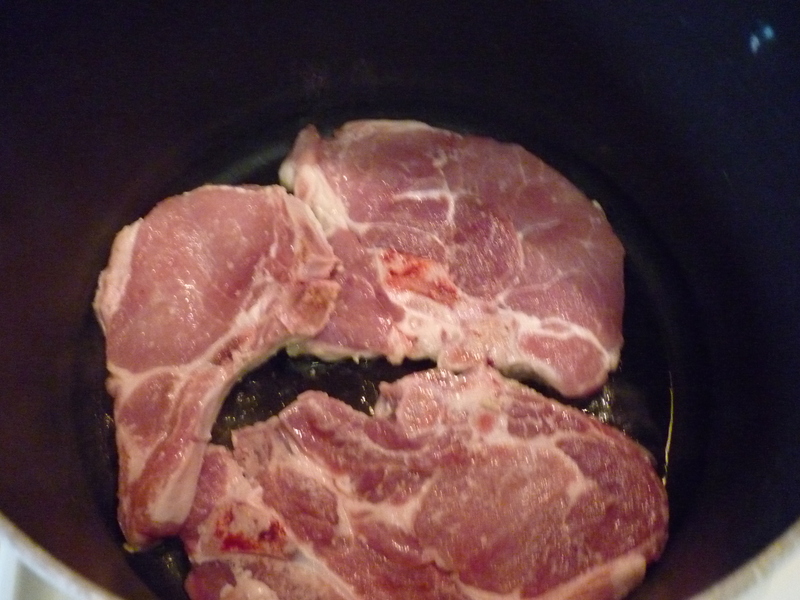 oil and add 4-6 pork steaks (in batches if necessary), frying till browned on both sides. 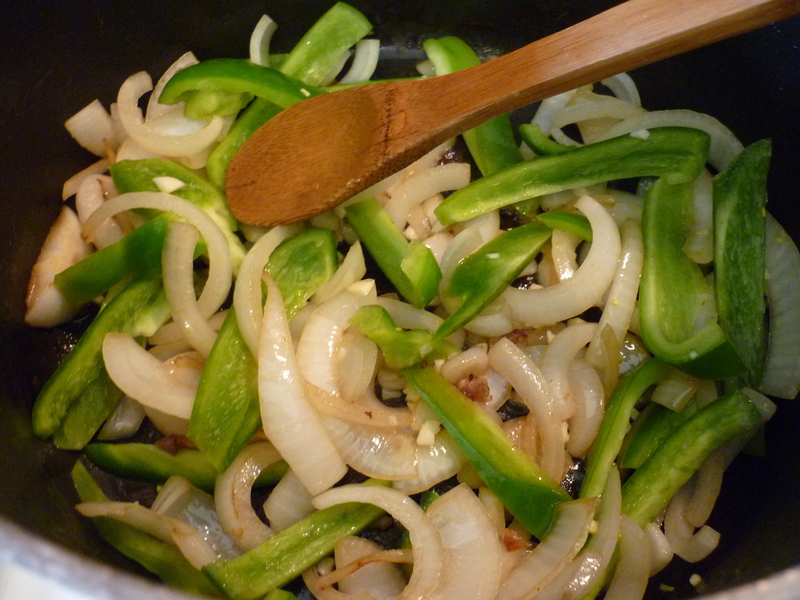 Remove from skillet and discard fat. Heat another 1-1/2 Tbsp. 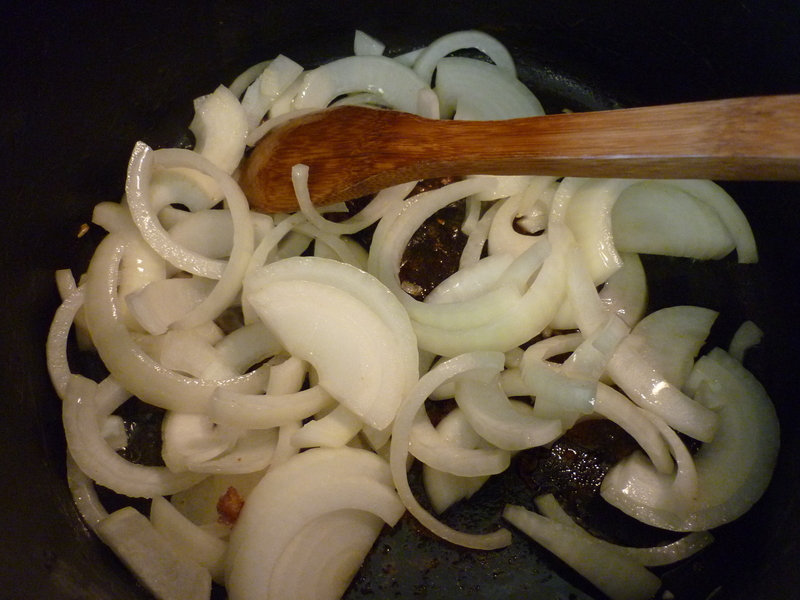 oil in the skillet and add 2 medium onions, sliced. Heat, stirring occasionally, for 3-5 minutes until lightly browned. 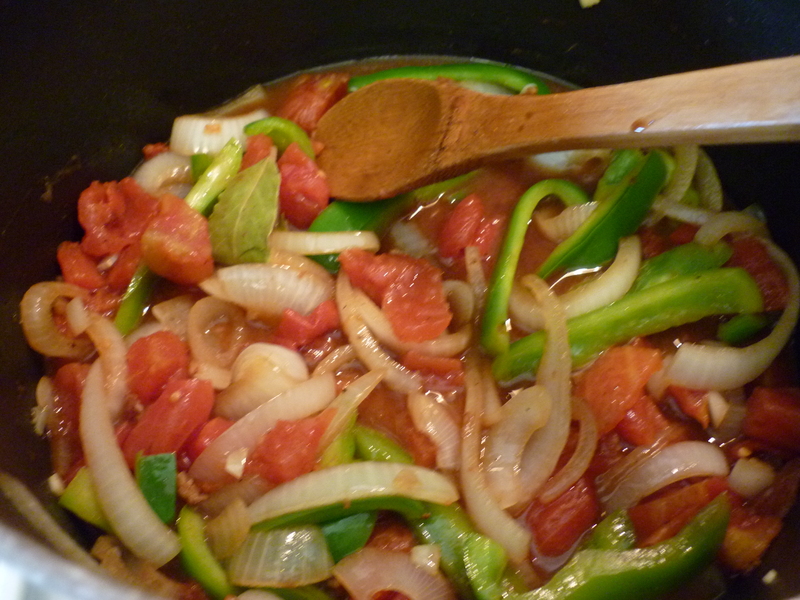 Add 1 bell pepper, sliced, and 2 cloves garlic, minced. Saute for about a minute. Add 1/2 cup white wine and bring to a boil, stirring to scrape up the browned bits from the bottom of the pan. Add 1 16-oz. can tomatoes with their juice, 3 Tbsp. 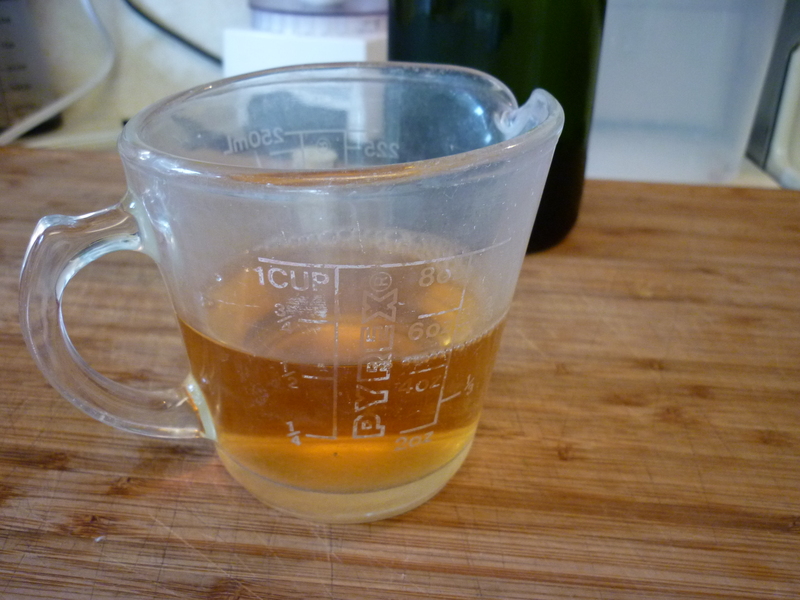 lemon juice, 1-1/2 Tbsp. Worchestershire sauce, 1/8 tsp. Tabasco, 1 tsp. salt, 1/4 tsp. pepper, 1 bay leaf. 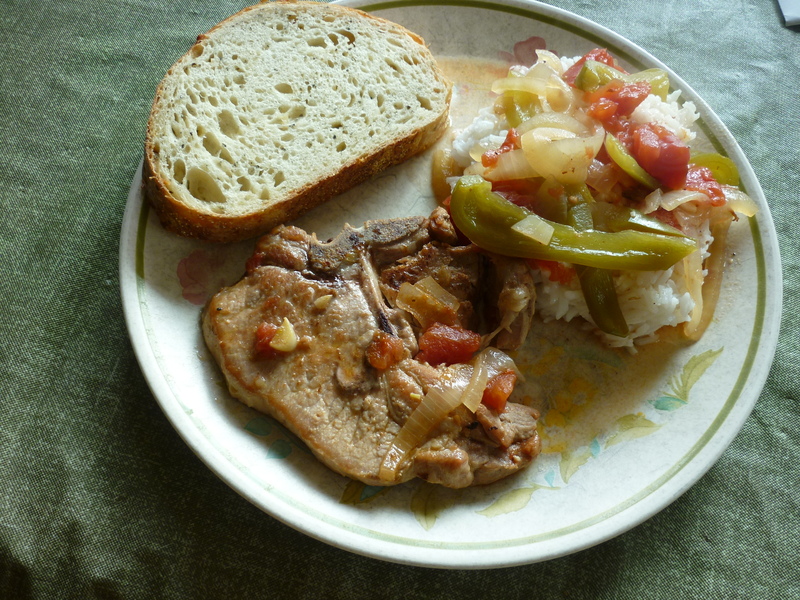 Return pork steaks to the pan and add enough water to just barely cover. 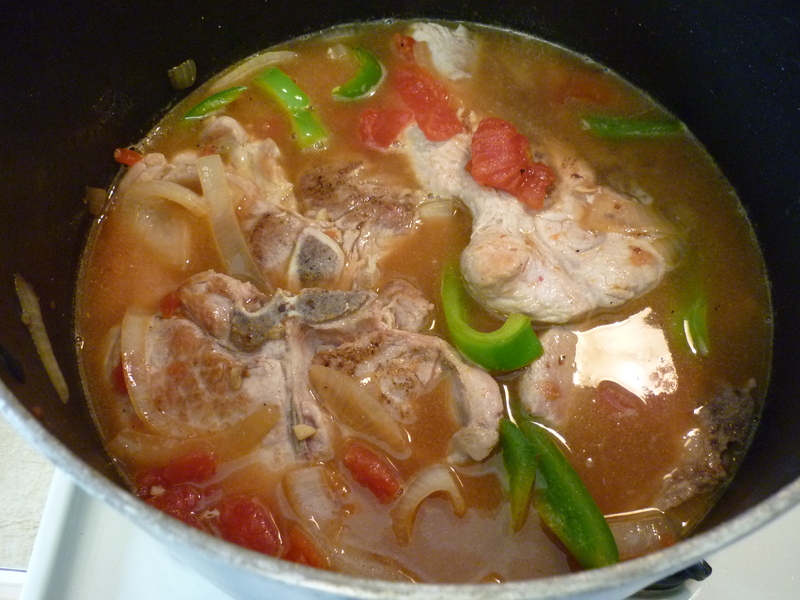 Stir around so everything is mixed well and the pork chops are mostly covered. 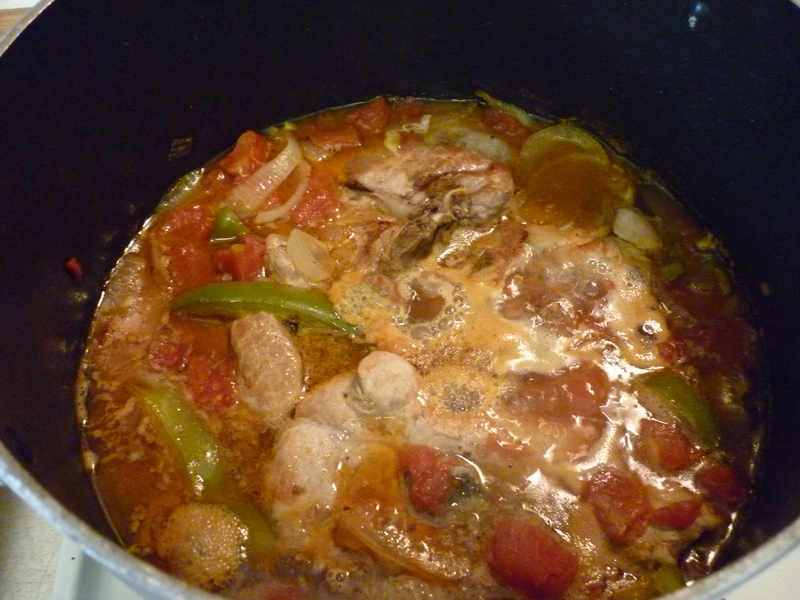 Partially cover the pan and let simmer for about an hour, turning the pork steaks occasionally, until they are tender. If the sauce is too watery, uncover and increase the heat to high. Let boil to reduce the liquid. 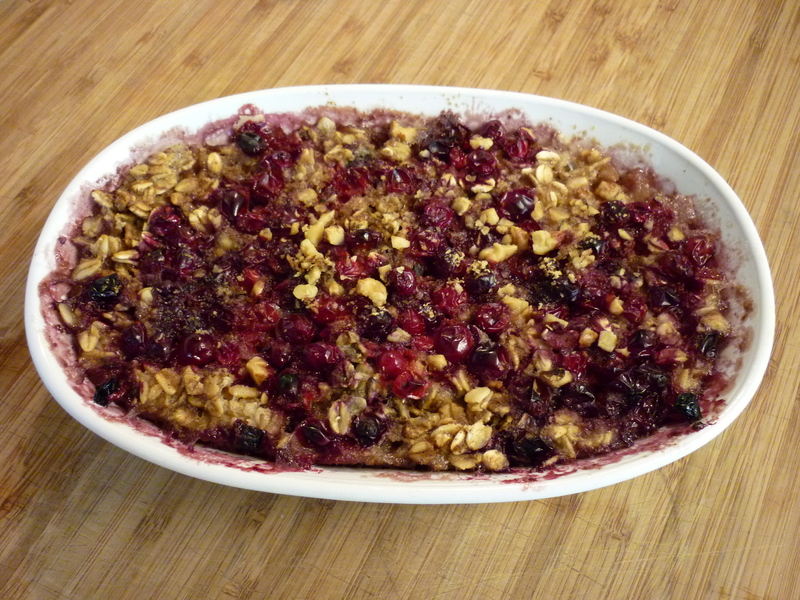 I don’t often eat breakfast, but I really enjoy this baked oatmeal dish. 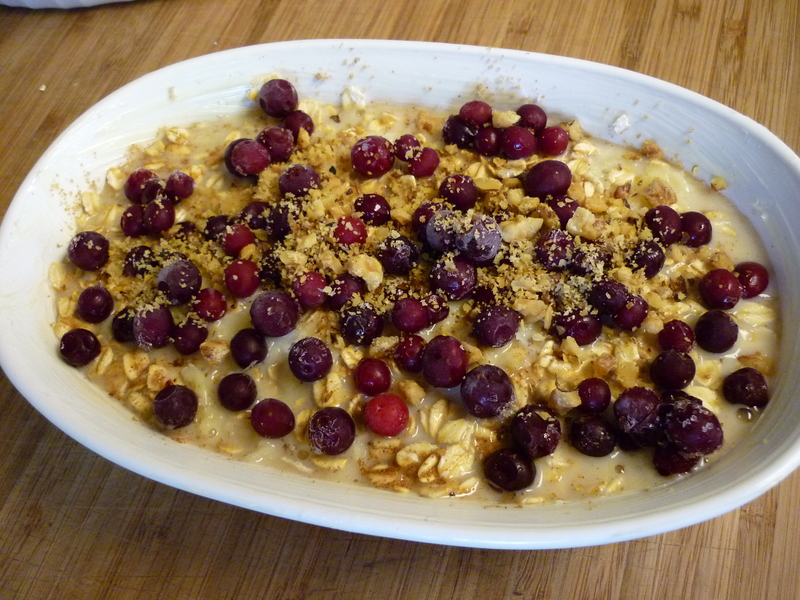 Today I used frozen lingonberries, but any kind of fresh or frozen berry should work fine. The dish keeps in the refrigerator for several days and reheats nicely in the microwave. This recipe makes 6-8 servings, so I like using several small baking dishes and then saving the unused portions in the refrigerator until someone gets hungry enough to pull one out and eat it. 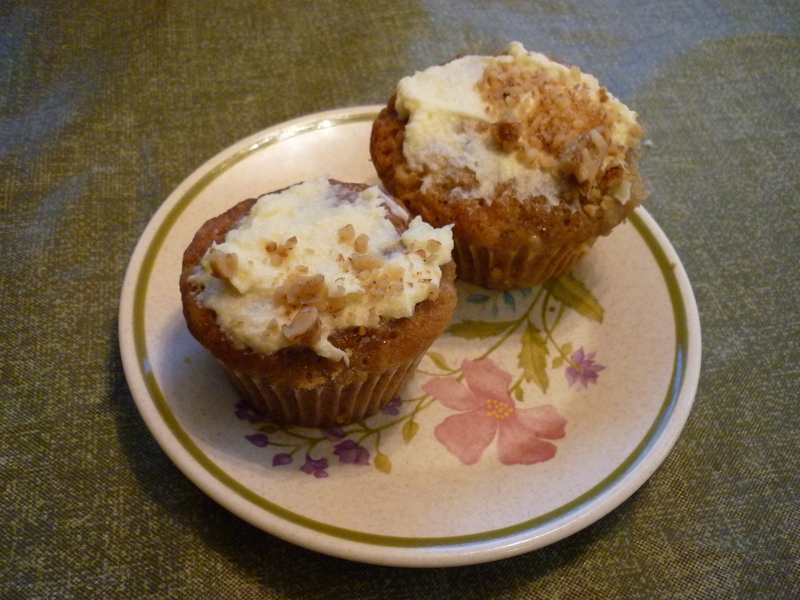 The recipe is based upon one I found on Epicurious, April 2011 by Heidi Swanson – Super Natural Every Day. While preheating the oven to 375 degrees, chop 1/2 cup walnuts and place on a oven-proof dish to toast. I put them on a dessert plate, but a pie tin works well too. 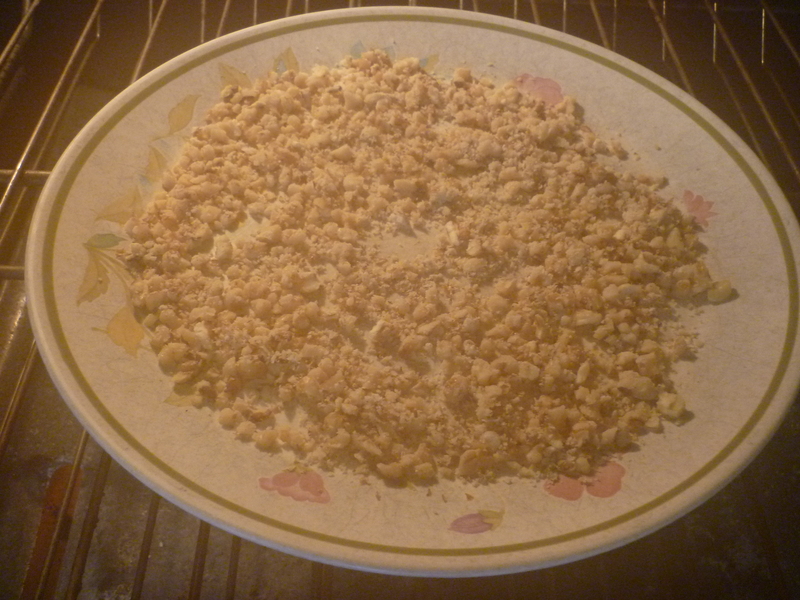 Shake or stir the walnuts around occasionally as the oven continues to heat up. Remove from oven once walnuts are a light brown color. 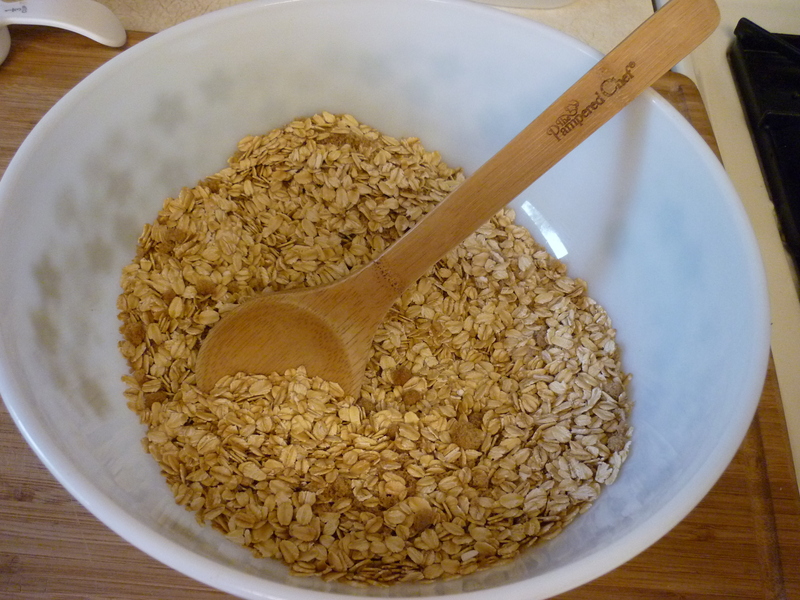 Mix together: 2 cups rolled oats, 1/3 cup sugar (or maple syrup-if using, add later with wet ingredients), 1 tsp. baking powder, 1-1/2 tsp. cinnamon, scant 1/2 tsp. salt, and 1/2 of the toasted walnuts. 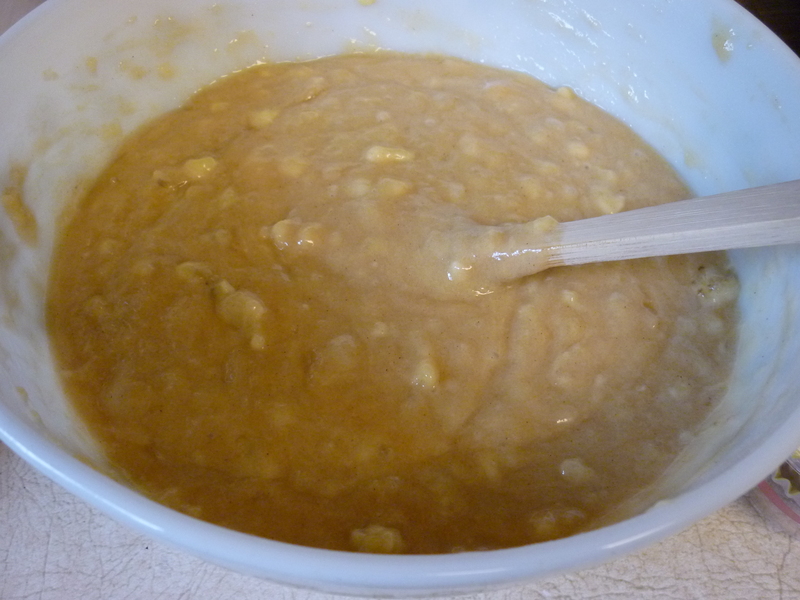 In a separate bowl (I use a 4-cup liquid measuring cup so I can easily pour the mix into the baking dishes) whisk together 1/3 cup maple syrup (if using), 2 cups milk, 1 egg, 1-1/2 Tbsp. melted butter, and 2 tsp. vanilla extract. 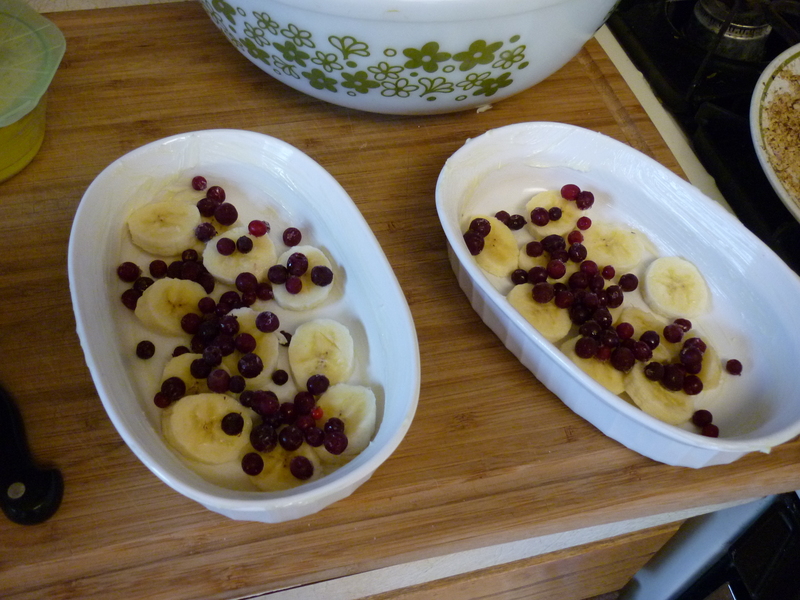 Arrange 2 bananas in a single layer in the bottom of a buttered 8″ baking dish. [Note: I used three small baking dishes.] 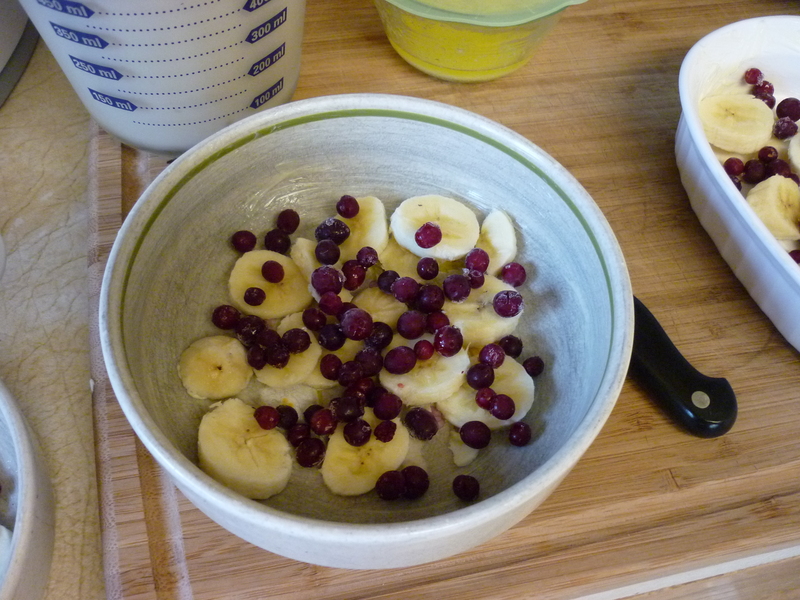 Sprinkle 1 cup berries over the bananas. Picture of my third dish baking dish. Cover the fruit with the oat mixture. Then slowly drizzle milk mixture over the oats. Tap the baking dish on the countertop to make sure the milk moves through the oat mixture. 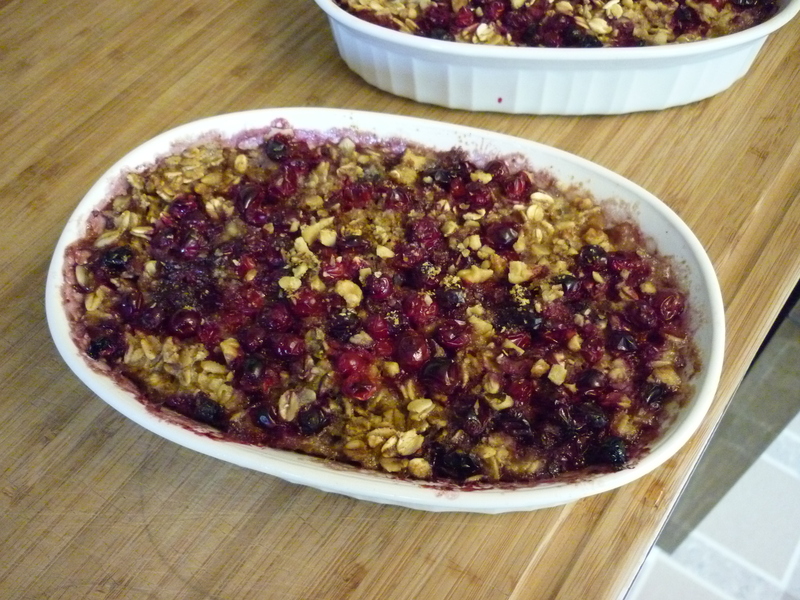 Scatter 1/2 cup more berries and toasted walnuts across the top. 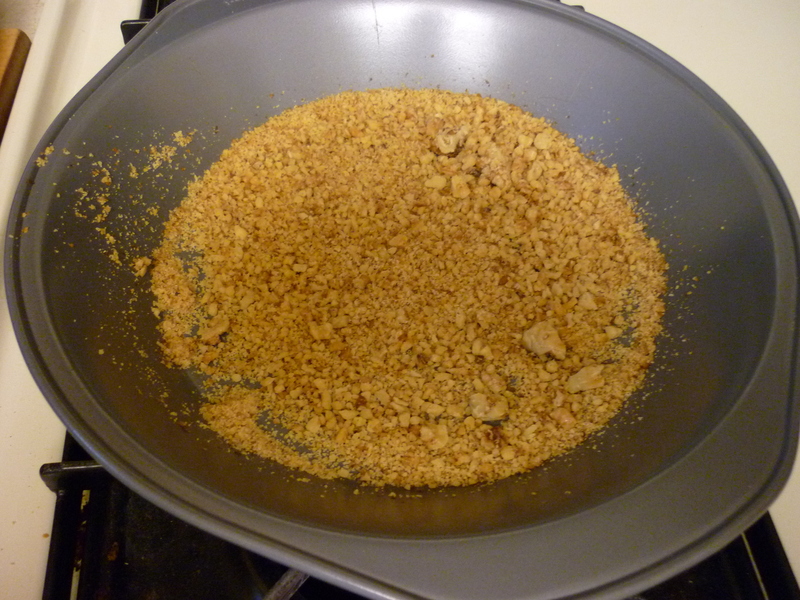 Bake at 375 degrees for 35-45 minutes, until the top is nicely golden and the oat mixture has set. Remove from oven and let cool for a few minutes. Serve with a little milk or other favorite oatmeal topping. Based on a recipe by Giada de Laurentiis on Food Network, this is a delicious and super easy breakfast/dessert. Set the oven to 325 degrees. Chop 1/2 cup walnuts. Place the walnuts in a pie pan or oven-proof saucer and then into the oven while it preheats. Give the walnuts a shake every once in awhile so they toast fairly evenly. Watch that they don’t burn. 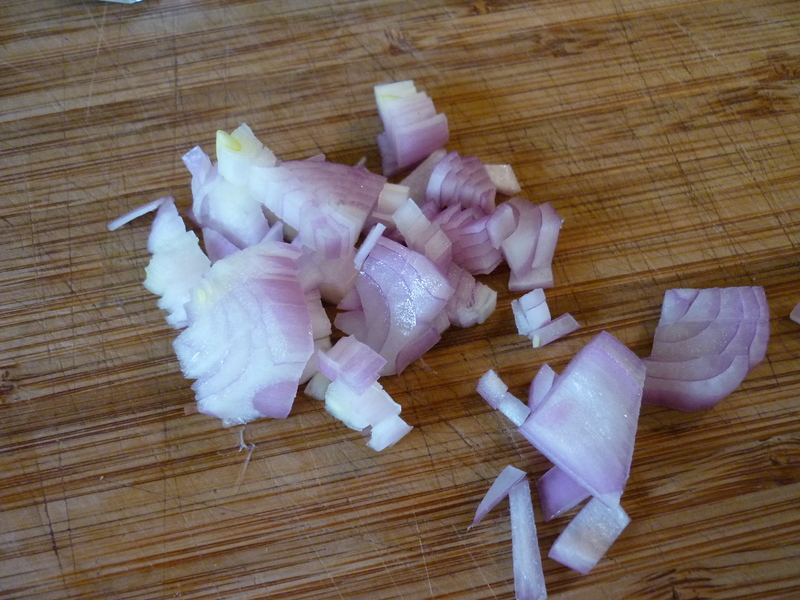 Remove from heat once toasted and set aside. 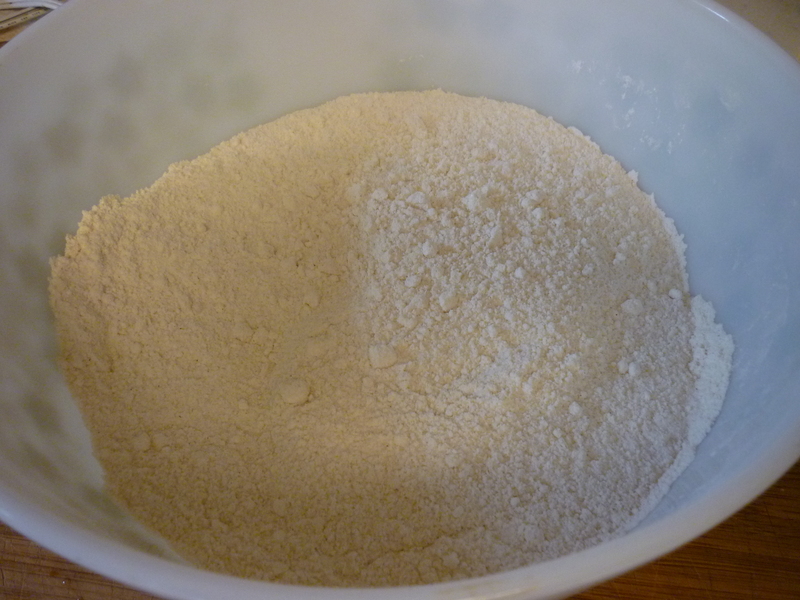 Stir together the dry ingredients: 3 cups flour, 1 tsp. baking soda, 1 tsp. salt, 1/2 tsp. baking powder, 1/2 tsp. cinnamon, 1/2 tsp. nutmeg, 2 cups sugar. Set aside. 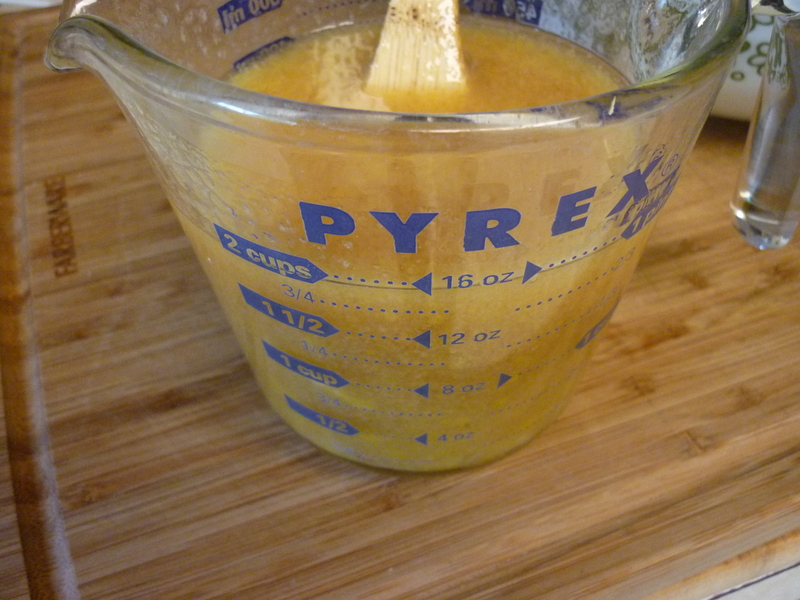 Mix together the wet ingredients: 1 cup oil, 3 eggs, 1 Tbsp. vanilla extract. Peel and mash 4 ripe bananas. Mix together the dry ingredients, the wet ingredients, and the mashed bananas. Stir until evenly moistened. Do not over-mix. 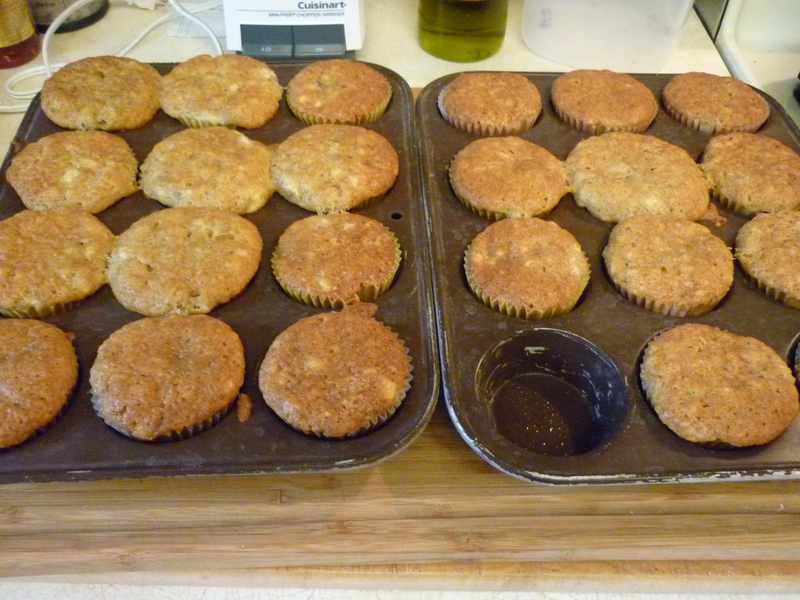 Divide batter among 24 prepared (either paper liners or greased tins) muffin cups. While the muffins are cooling, stir together 3 oz. cream cheese, 6 Tbsp. butter, and 1/3 cup mascarpone cheese, all at room temperature. Stir in 3 Tbsp. honey. 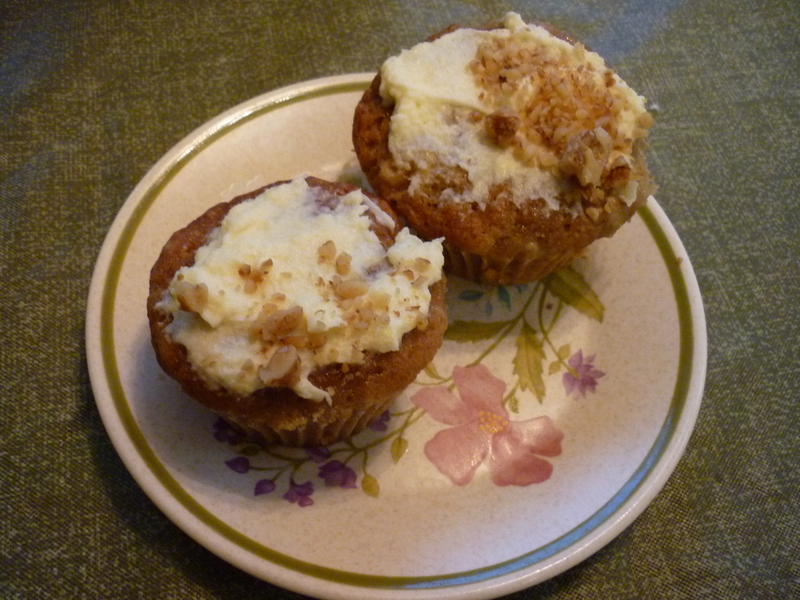 Spread a dollop of frosting over each muffin and sprinkle with toasted walnuts. Dig in!